Toni Mullany of Waynesville sent me an email the other day noting a guest scoping out her phlox. She described the critter thusly, “It is about the size of a large bumblebee. It is all black. It has furry head and a large proboscis. Its movements are rather slow. There is usually a pair. It seems to be a cross between a butterfly and a bumblebee drawn by Dr. Seuss or a very creative 6 year old.” And I believe that is about as good a description as one could give in reference to the hummingbird clearwing moth, Hemaris thysbe. Hemaris thysbe is in the family Sphingidae or sphinx moths. 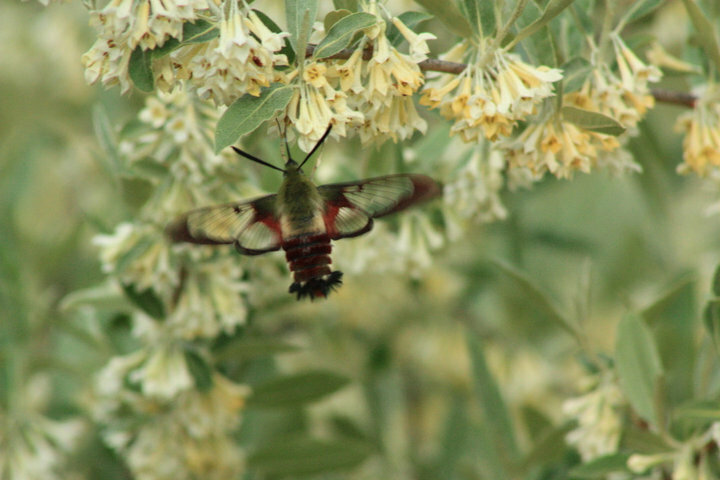 The hummingbird clearwing moth ranges from Alaska through British Columbia to Oregon and east across the Great Plains to Maine and south to Florida and Texas. And while the body of the bug itself is about the size of a large carpenter bee, the wingspan is usually just over two inches. This brightly colored moth is diurnal and hovers while nectaring at flowers with its long proboscis like a hummingbird. The thorax (remember it’s an insect – with a head, thorax and abdomen) is generally a golden to brownish olive above and cream or yellowish below. The abdomen is so dark burgundy that it often appears black much like the throat of a male ruby-throated hummingbird. The cellophane-like wings are mostly clear with reddish borders. There are four species of Hemaris in the Americas. They include H. thysbe, H. diffinis, H. gracilis and H. senta. Senta is a western species commonly known as the Rocky Mountain clearwing. I believe thysbe would be the most common species in Western North Carolina. Diffinis or the snowberry clearwing can easily be distinguished from thysbe by its yellow thorax and abdomen. Gracilis or the slender clearwing is a pretty rare moth in the East. It can be distinguished from thysbe by its chestnut bands or streaks on the sides of the thorax. Some of the primary host plants for the genus Hemaris include honeysuckle, hawthorns, cherries, plums and snowberry. Hemaris caterpillars pupate in cocoons that are spun on the ground. The hummingbird clearwing in Western North Carolina probably hatches two broods, one between March and June and one between August and October. In the northern part of their range, Hemaris moths generally produce one brood sometime between April and August. In Louisiana and other southern states the hummingbird clearwing may produce as many as six broods. Besides phlox, adult hummingbird clearwings will nectar at various asters, bee balm, vetch, blueberry, thistle and butterfly bush.